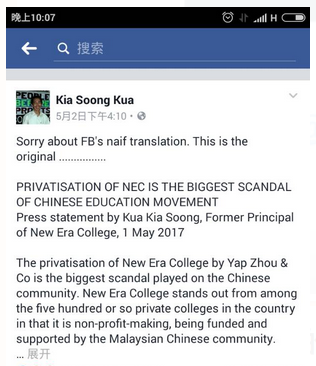 The privatisation of New Era College by Yap Zhou & Co is the biggest scandal played on the Chinese community. New Era College stands out from among the five hundred or so private colleges in the country in that it is non-profit-making, being funded and supported by the Malaysian Chinese community. Three main organisations in Malaysian Chinese education were entrusted to build NEC, namely Dong Zong, Jiao Zong and Merdeka University Bhd. Together they formed DJZ Higher Learning Centre for the specific purpose of setting up New Era College. From the outset, the Constitution of DJZHLC was designed so as to ensure that these three important organisations in the Chinese education movement were amply represented with five members each in the DJZHLC board and that the Chair of Dong Zong was made the natural Chair of DJZHLC. Since the early days of Merdeka University in the seventies, the Malaysian Chinese community has contributed generously to fund this tertiary level institution. The same was true for the NEP project right from its inception. Every fund raising event is a tale of profound sacrifice by Chinese educationists in the DJZ secretariat as well as volunteers in the community who contributed not just money but their talents in fund raising and performances. Through their efforts we built first the DJZ Building in the Nineties and then during 2000, work started on our new Academic Block and the Hostel Block. Reminiscent of the fundraising for Nanyang University during the Fifties, people from all walks of life contributed to our building fund. Some of the most memorable events included the Trishawmen’s Association of Penang who contributed RM40,000 of their day’s takings to the college in 2001. In all, the three blocks in the Kajang campus cost around RM35 million. When I took over as principal in 2000, our total enrolment was only at 280; we had made a loss of RM1 million for that year, and our accumulated loss stood at RM3.5 million. Sustainability was only achieved through drastic expenditure cuts and the introduction of “socialist” measures. One of the first cuts we undertook was to sell the principal’s car as an example for all the staff to follow in this austerity drive. It matched our commitment to sustainable transport. There would only be “college vehicles” and no vehicles for privileged personal use while we were in financial straits. Upgrading the salaries of the clerks and executives was our priority in raising staff morale while top salaries were capped throughout my term as principal in order to narrow income polarity. In the first few years, the top management also contributed a portion of our salaries every month toward the salaries of the clerks and executives. From 2001 onwards, we began to make profits every year. By 2003, the accumulated losses had been wiped clean and by the time we left at the end of 2008, we had made a profit of RM1 million that year. The total enrolment for that year was already 1700 students. Since we have left, NEC began to make losses again from 2009 onwards as enrolment dropped. I understand that the accumulated losses made by NEC up until today now amount to more than RM7 million! Yap Zhou & Co. must bear full responsibility for this fiasco and the drastic fall in enrolment following the disastrous NEC controversy. They have not only destroyed the sustainability of the NEC finances we created but they have also totally destroyed the democratic system that we built in the 10 years up to 31.12.2008. Decisions are now made by a few cronies at the top so they should not try to blame the heads of department and staff for this fiasco. They have destroyed in one year the inclusive and democratic culture of the New Era Education that we created in the campus. The privatisation of NEC is more serious than the JJPTR scandal! In the JJPTR scandal, it is only the few investors who have lost their money. 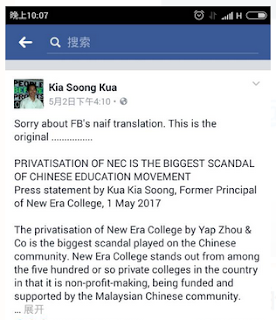 In the privatisation of NEC, the dreams of our Chinese education visionaries Lim Lian Geok, Lim Fong Seng and Sim Mow Yu have been smashed since DZ, JZ and Merdeka University Bhd, the trustees of NEC no longer have a say in NEC – the “Son of Duda”. Yap Zhou & Co. have changed the constitution of DJZHLC to reduce the number of representatives of DZ, JZ and MUB from 5 to 2 members. Ever since that undemocratic move, these three founding organisations of the Chinese Education Movement have boycotted the DJZHLC and rightly so. The Chinese community must not allow these characters to get away with this privatisation of NEC. NEC belongs to the whole community which entrusted DZ, JZ and MUB to look after this ‘Son of Duda’. It is shocking that since 2009, they have accumulated a loss of more than RM7 million for the college. It is clear that the community must not fall for their undemocratic scheme and demand that NEC be once again put under the care of DZ, JZ and MUB.